Sage CRM has its own internal e-Mail client that allows users to create, send and manage emails entirely within CRM. 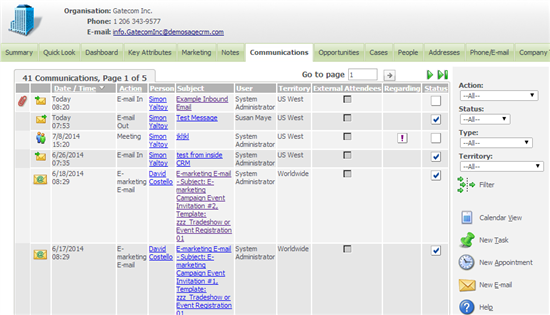 The image above shows a list of communications for a company that includes emails that have either been been created by the Sage CRM internal E-mail client or have been filed automatically within Sage CRM by the Advanced E-mail Manager. 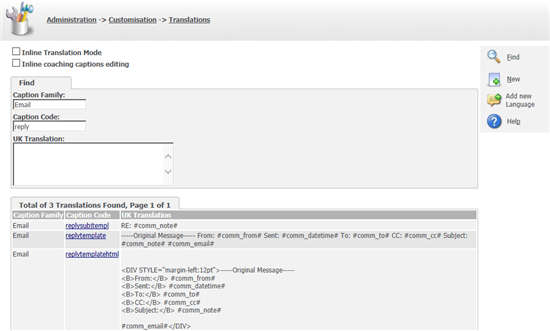 In this article I want to consider how you can edit the default translations used to provide the text used in Sage CRM's internal e-mail client as e-mails are replied to and forwarded. 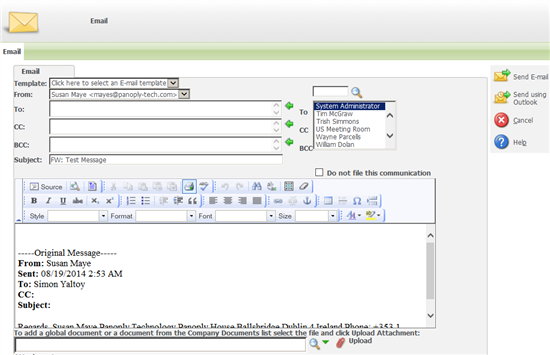 The internal e-Mail client allows the user to forward or reply to the email directly from within the Sage CRM interface. If the 'Forward' button is clicked then a similar screen is produced. The two screens look very alike with the difference that the 'To' address has been automatically completed when the 'Reply' button is clicked. 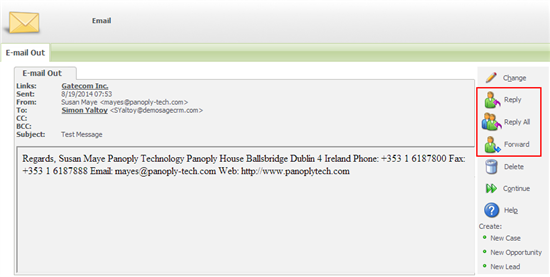 Other than that the two responses have similar information automatically included in the outgoing email body. And this is the point of the article. What determines the text that is automatically included? 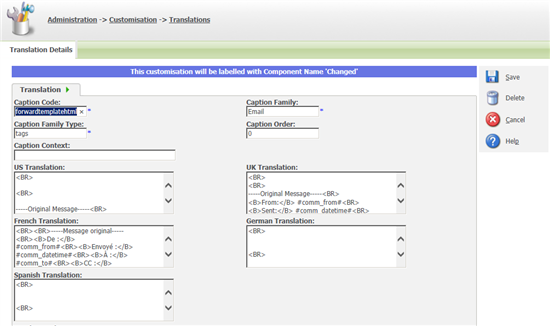 If you are ever left wondering what controls a feature in Sage CRM and that you can not find an option for it within the Administration screens then it is a pretty good bet that Translations or Custom Captions are used to control it. And this is the case for the Reply and Forward text. If you search under the Translation area you will find the captions that can be changed to control the text used in the responses. For the Reply and Forward text there are three important translations which are the email's subject , plain text body and HTML body. You could change the text separator used, the order of fields include or which fields are included from the original communication. The use of the ## merge fields is similar to the usage made in e-Mail templates and within some of the workflow action defintion screens. Hi Jeff, do you think it would be feasible to use this to include custom email fields in the Email Management Server filing process? 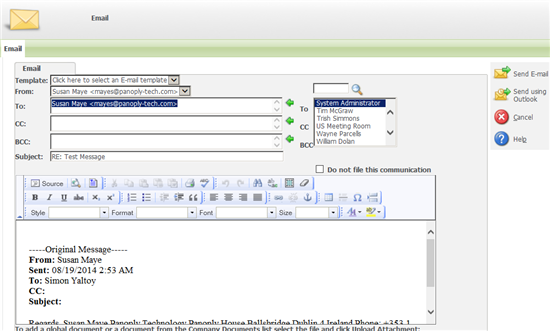 For example if I have custom email fields on the lead, say lead_newcompanyemail. I don't think so, as this is really only about the manual forwarding and reply to emails already in the system not the automatic processing of inbound emails. The processing of the inbound email by the Advanced E-mail Manager would be controlled by the script templates. The script gives you full access to the CRM API so you would be able to interact with the Lead data including custom fields in anyway you want.